Friday, July 11, 2014, 7:30 p.m.
Saturday, July 12, 2014, 7:30 p.m.
Sunday, July 13, 2014, 2:30 p.m. Gypsy is the true story of the ultimate show business mother, Mama Rose, and her two daughters trying to “break into the big time” in the 1920’s vaudeville era. Based on the 1957 memoirs of the famous burlesque entertainer Gypsy Rose Lee, it follows Rose’s dreams and efforts to raise her two young daughters to perform onstage and survive the ups and downs of show business life. Including many songs that became popular standards (“Everything’s Coming Up Roses,” “Together (Wherever We Go),” and “Let Me Entertain You”), Gypsy has frequently been described by critics and writers as one of “the greatest of all American musicals [Ben Brantley, The New York Times].” After its original 1959 production with Ethel Merman, Gypsy was revived four more times on Broadway starring Angela Lansbury, Tyne Daly, Bernadette Peters, and Patti LuPone, winning a total of six Tony awards. This production of Gypsy features a large cast of 42 actors, singers and dancers ranging in age from 6 to 70, who have appeared in productions with RiverStage, Valley Players, Gaspipe Theatre Company, Community Theatre League, PA Stage Company, Williamsport Civic Ballet, Christ Wesleyan Church, Bloomsburg University, Cambridge University, Juniata College, Lycoming College, Shippensburg Univerisity, Susquehanna University, Temple University, and high schools including Lewisburg, Milton, Hughesville, and Warrior Run. Marina Gresh of Danville, who appeared in RiverStage’s Joseph and the Amazing Technicolor Dreamcoat last summer, will play Mama Rose. Her daughters, Louise and June, will be played by Melissa J. Mabus of Laporte and Rachel Kador of Winfield. Melissa has been seen locally in shows with Milton Area Community Theatre (A Funny Thing Happened on the Way to the Forum) and Community Theatre League (The Secret Garden, Little Shop of Horrors), and Rachel is an alumna of University of Massachusetts’ Sketch-22 comedy troupe as well as the Albright Theater. Jason Puckey of Watsontown, last seen as the Beast in the West Deptford Theatre’s Beauty and the Beast, will play their agent Herbie. 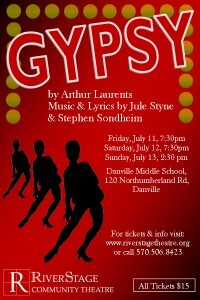 Gypsy will be the third RiverStage production directed by Wakeman, and supporting her behind the scenes will be Russell Wynn, Jr., choral director at Milton Area High School, and assistant director Christine Remley, with production design by Dennis Merkle, stage management by Claire Paulsen, and choreography by Jamie Karichner. Other featured players in the show include Nicole Shoop, Kimie Muroya, Gabby Moore, Bryanna Kifolo, Jessica Paquin, Jessica Confer, Austin Duclos, Tim Hippensteel and Michael Sampsell. Also in supporting roles will be Ron Toczek, Kurt Umholtz, Ken Kopf, Andrew Shaffer, Derek Scott, Elaine Borgese, Brad Wakeman, Gabrielle Taylor, Emily Gibson, Maggie Able, Karen Herschell, and Melissa Koveski. They will be joined onstage by area elementary and middle-school students Sara Koveski, Grace Bruckhart, Gabby Markunas, Linette Taylor, Jacob Rousu, Jaden Crowley, Lucy Gustafson, Max Gustafson, Olivia Crumb, Paetyn Garinger, Hannah Garinger, Ellie Jacks, Taija Figard and Allison Rousu.